The waterBOB® is a water containment system that holds up to 100 gallons of fresh drinking water in any standard bathtub in the event of an emergency. Constructed of heavy duty food grade plastic, the waterBOB® keeps water fresh and clean for drinking, cooking, washing and flushing. Water stored in an open bathtub, with dirt, soap film and exposure to debris will spoil and become useless. During a hurricane or tropical storm, water main breaks and storm surges can interrupt or even contaminate your water supply. It is during these conditions the waterBOB® may be used for temporary water storage. Constructed of heavy duty plastic that is FDA compliant for food storage, the waterBOB® keeps water fresh and clean for up to 4 weeks. 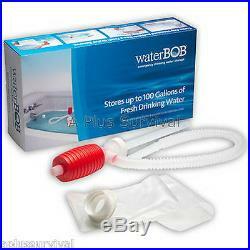 The waterBOB® is very easy to use. Simply lay the liner in any standard bathtub, attach the fill sock to the faucet and fill the bladder to capacity, which takes approximately 20 minutes. A siphon pump is included to easily dispense the water into jugs or pitchers. Be prepared with the waterBOB® Specifications. Dimensions in packaging: 13.5" x 7" x 3.5. Weight in packaging: 1 lb 10.5 oz. Your complete satisfaction is important to us and we treat each order with care and respect. If the item is not as described, doesn't arrive well-packaged or on time. Let us know so we can do whatever we can to resolve the issue. Shop where the Professionals Go! Who is A Plus Survival? A Plus Survival specializes in Emergency Preparedness products. Established in 2008, we are a fast growing supplier of preparedness, disaster, and survival products. Your complete satisfaction with our products, value, and service is what makes us succeed! We offer a wide variety of Survival, Emergency, First-Aid, Safety, Food, and Water products. Other items include Lighting, Search and Rescue, Pet Supplies, Shelter, Communication, Triage, Sanitation Supplies, Camping Gear and much more. We also offer Survival Kits that range from 1 person to over 1000 people or more. We will custom make any kit you desire and for as many people as you need and as many days as you want. We offer custom Screen Printing and Embroidery on many of the items we sell. We realize the importance for every person in the world to be prepared with an emergency survival kit to sustain that individual for 72 hours until adequate help arrives. We are not manufacturing low quality kits just to make a sale because they are less expensive. Our company decided in the very beginning that we were going to provide high quality products with adequate food, water, and other products which would actually assist in saving lives. We can not prevent disasters but we are dedicated to helping our customers make it through the tough times when they arrive. Thank you for shopping at A Plus Survival. The item "100 Gallon Capacity Water Bob & Pump Bathtub Liner for Emergency Survival Kits" is in sale since Thursday, June 27, 2013. This item is in the category "Sporting Goods\Outdoor Sports\Camping & Hiking\Water Bottles & Hydration\Other Bottles & Hydration". The seller is "aplussurvival" and is located in Middleton, Idaho. This item can be shipped to United States, Canada, United Kingdom, Denmark, Romania, Slovakia, Bulgaria, Czech republic, Finland, Hungary, Latvia, Lithuania, Malta, Estonia, Australia, Greece, Portugal, Cyprus, Slovenia, Japan, China, Sweden, South Korea, Indonesia, Taiwan, South africa, Thailand, Belgium, France, Hong Kong, Ireland, Netherlands, Poland, Spain, Italy, Germany, Austria, Russian federation, Israel, Mexico, New Zealand, Philippines, Singapore, Switzerland, Norway, Saudi arabia, Ukraine, United arab emirates, Qatar, Kuwait, Bahrain, Croatia, Malaysia, Brazil, Chile, Colombia, Costa rica, Panama, Trinidad and tobago, Guatemala, Honduras, Jamaica.